(AFP) - Despite long-standing restrictions, new weapons have continued to reach South Sudan's battlefields, often via neighbouring countries, a detailed report by an arms monitoring group said Thursday. A four-year investigation, by London-based Conflict Armament Research (CAR), into the supply of weapons that have helped keep South Sudan's civil war alive since December 2013, has revealed the important role played by neighbouring countries, particularly Uganda, in circumventing arms embargoes. 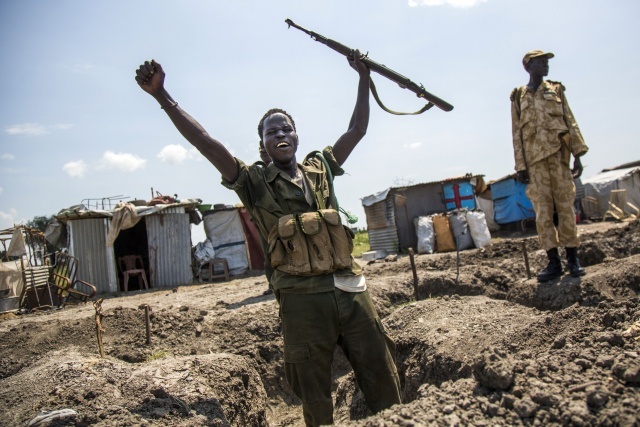 While the UN Security Council did not impose an arms embargo on South Sudan until July 2018, more than four years into a war that has killed an estimated 380,000 people, the EU has banned direct sales of weapons by member states to Sudan since 1994, amending the embargo to include newly-independent South Sudan in 2011. Nevertheless, the government army -- known as the SPLA, or Sudan People's Liberation Army -- has been kept well supplied with weaponry, often funnelled through Uganda and sometimes originating from Europe or the US. The rebel SPLA-IO (SPLA In Opposition) has had less success in sourcing weapons, the researchers found, relying heavily on scavenging arms. CAR executive director James Bevan said his group's "comprehensive, on-the-ground survey of the weaponry used" included documenting hundreds of weapons and more than 200,000 bullets. "The result is a forensic picture of how prohibitions on arms transfers to the warring parties have failed," he said. CAR found that, despite numerous allegations and rumours, no new Chinese weapons reached South Sudan after May 2014, six months into the war. Nevertheless, two large shipments of Chinese weapons to Juba, via Mombasa in Kenya, while legal due to the lack of any arms embargo, ensured the SPLA was well-supplied for the ongoing civil war: the shipments included more than 27 million rounds of small-calibre ammunition, as well as rockets, grenades, missiles, pistols assault rifles and machine guns. CAR found that, while Chinese ammunition had previously accounted for "less than two percent" of bullets in circulation in South Sudan, once the shipments arrived over half the ammunition in use was Chinese. "The logical conclusion is that the 27 million rounds of small-calibre ammunition legally transferred to the SPLA from China in 2014 have sustained SPLA operations in the years since," CAR said. Meanwhile, Uganda "has continued to be a conduit for materiel" to the SPLA, CAR said. Ugandan President Yoweri Museveni is a stout supporter of South Sudan's President Salva Kiir. Kampala is alleged to have transferred to South Sudan weapons legally supplied to Uganda in 2014 and 2015 from manufacturers in Europe and the US, most likely without the knowledge of the companies involved. The re-transfer of weapons may contravene clauses contained in the so-called end-user certificates that are intended to ensure weapons are used by the countries they are originally sent to. The armaments have included military aircraft as well as ammunition sold to the Ugandan military. CAR also found evidence of long-suspected Sudanese weapons deliveries to SPLA-IO, but not recently. The researchers' work also underscored how isolated the rebels, under former vice president Riek Machar, have been, leaving fighters short of both external supporters and bullets. "Despite allegations made by the SPLA during 2017, CAR has found little indication of external resupply to the SPLA-IO since mid-2015," the report said. Efforts by Machar in early 2014 to seek delivery of a "shopping list" including 43 million rounds of ammunition, mortars, rockets, rifles and surface-to-air missiles failed. Instead rebels have been forced to rely on defections, or capturing weapons after battles.